Professional image editing tools that anyone can use. 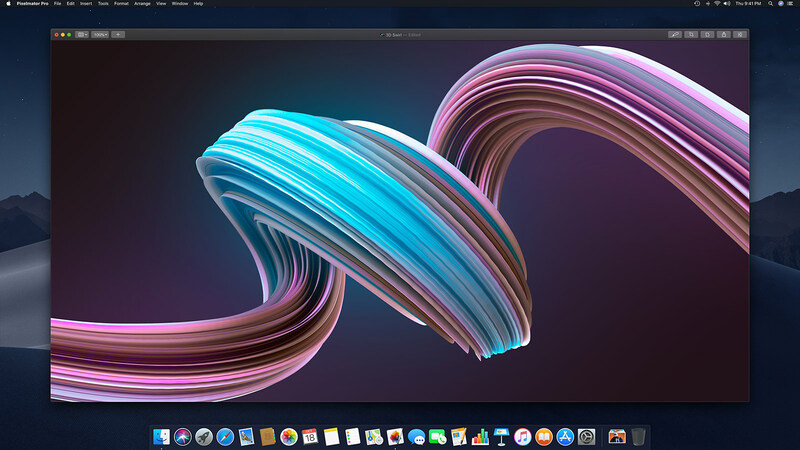 Pixelmator Pro is an image editor designed to make the most powerful professional image editing tools accessible to everyone. And with an extensive collection of tools for editing and retouching photos, creating graphic designs, painting, drawing vector graphics, and adding stunning effects, it’s the only image editor you’ll need. 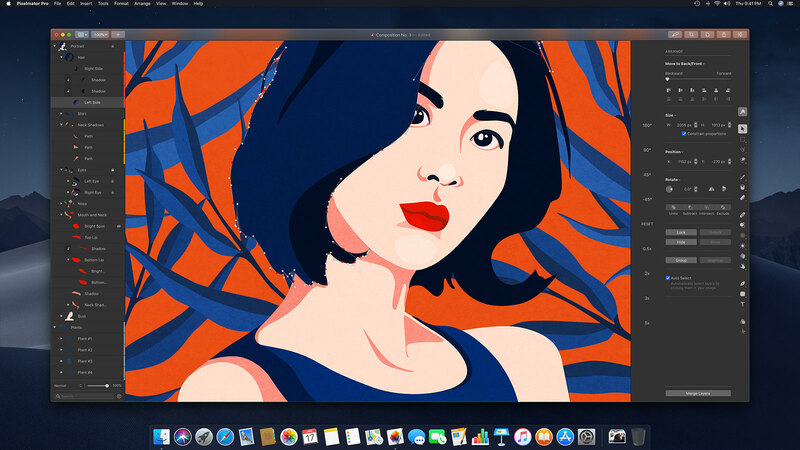 Pixelmator Pro 1.3 Prism introduces a range of handy new features that make creating advanced illustrations and designs easier than ever — layer color tags, filtering and search, clipping masks, quick opacity and blending controls, and more. Thanks to the brand new color tags feature, you can now easily color-code layers in your Pixelmator Pro compositions. Use color tags to make important layers easier to spot or bring some extra organization to advanced illustrations and designs. Finding just the layers you’re looking for is easier than ever. Pixelmator Pro 1.3 Prism brings another great improvement to the Layers sidebar — layer filtering and search. So you can temporarily filter out layers by type or tag. Or use the new search feature to instantly find important layers in complex compositions. Effortlessly create perfect masks from any layer in a composition. Clipping masks let you effortlessly clip the contents of one layer to the shape of another — even layer groups and nested shapes! So you can create a mask from any layer in your composition with just a click. Change a layer’s opacity and blending mode right in the Layers sidebar. With opacity and blending options always at hand, you no longer have to choose the Style tool to make quick blending changes to a layer. And, when browsing blending modes, you’ll still see an instant preview of each blending mode right in your image. Pixelmator Pro is a powerful, beautiful, and easy to use image editor. Featuring an elegant and streamlined single-window interface, it puts all the focus on the images you edit, rather than what's around them. 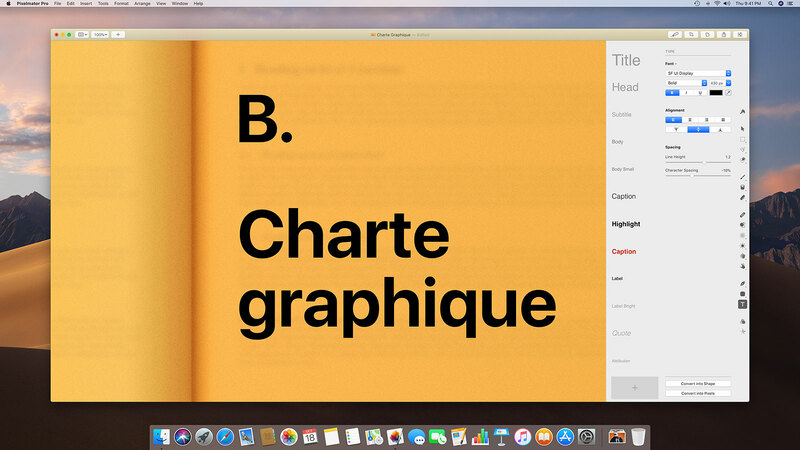 And with a design that is totally and completely Mac, it feels instantly familiar from the moment you first open the app. So image editing becomes simpler and more enjoyable than ever. 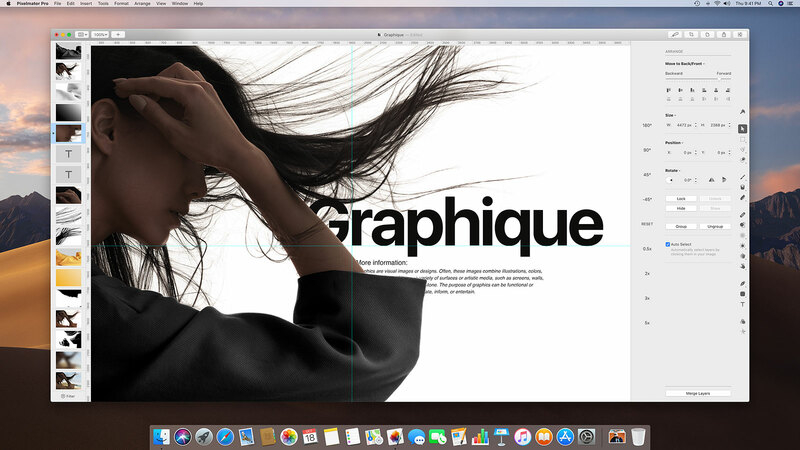 Everything you need to create stunning layouts. 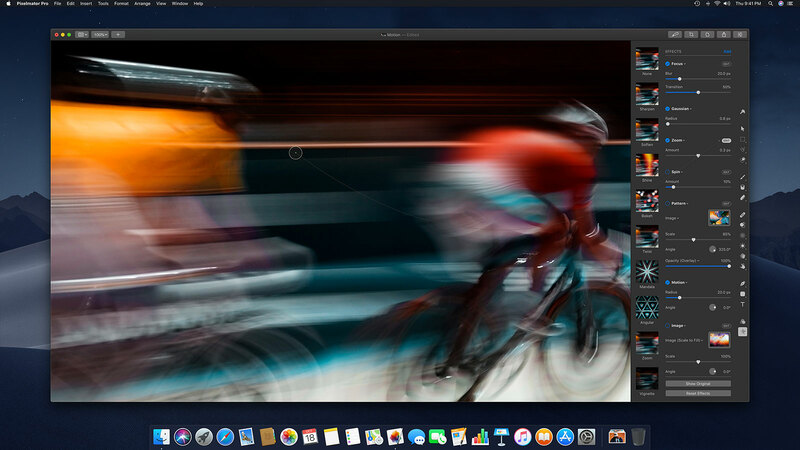 With intelligent, intuitive tools for moving, resizing, and arranging layers, Pixelmator Pro makes it incredibly easy to put every object in your composition exactly where you want it. The Arrange Tool is nondestructive so you can resize and rotate with total freedom. Smart spacing guides appear automatically to help evenly arrange objects. And advanced alignment tools give you a way to align multiple objects with a single click. So no matter what kind of composition you're working on, Pixelmator Pro is the perfect app for building it up, piece by piece. An all-new digital painting experience. Pixelmator Pro is a dream to paint with. Thanks to a cutting-edge painting engine powered by the Metal 2 graphics technology, painting is staggeringly responsive, fluid, and natural. We’ve also packed in a stunning collection of handcrafted brushes with dual textures, advanced brush dynamics, and our new Dynamic Paint Blending technology. 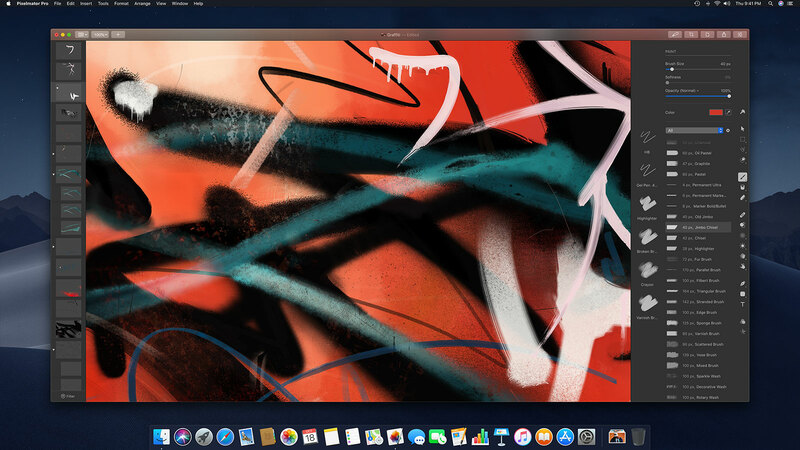 With a range of innovative features and new technologies, painting in Pixelmator Pro is more enjoyable than ever — whether you’re just scribbling and sketching or creating complex paintings. Every color adjustment for picture-perfect photos. 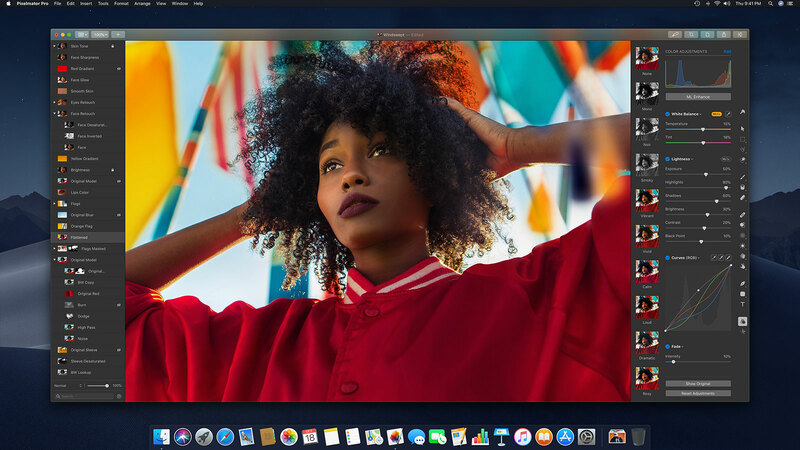 Featuring a collection of powerful, nondestructive color adjustments, Pixelmator Pro lets you edit the colors in your photos in any way you want. Each adjustment has breathtaking color quality thanks to advanced image processing techniques that eliminate posterization artifacts and improve clarity. The RAW Layers feature lets you edit multiple RAW images as layers in a single document using all the additional image detail saved in your RAW files. And Recipes give you a way to easily save, reuse, and share your favorite adjustment combinations. Pixelmator Pro comes with a collection of versatile effects that you can mix and combine to develop any artistic or special effects you can imagine. They’re nondestructive, so you can always edit, rearrange, and remove the effects you’ve applied, and even apply multiple effects to a single layer — seeing all your changes in real time. And now, thanks to Recipes, you can save all the effects you develop, use them in any of your images, and even share them with others. A magical Repair tool. The world’s smartest and fastest Quick Selection tool. A beautiful collection of shapes and drawing tools. Breathtaking layer styles. That’s just a few of the over 40 awesome tools Pixelmator Pro includes — each one designed and refined with a meticulous attention to detail. Machine learning-enhanced, GPU-powered image editing. The incredibly modern image editing engine in Pixelmator Pro is seriously sophisticated and seriously powerful. It’s powered by the graphics processor in your Mac, in tandem with advanced Mac graphics technologies such as Metal 2 and Core Image. Pushing the boundaries of image editing, Pixelmator Pro also includes machine learning-enhanced editing features. So tools are not just blistering fast — they’re whip smart too. Available on the Mac App Store for $39.99.